Former Moorland School pupil Joe Grayson – son of ex-Preston North End boss Simon – is in the record books already after making his debut for Blackburn in their League Cup tie against Lincoln City. His Rovers debut saw the first father and son pairing to represent the Championship club for 89 years. 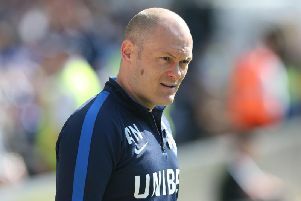 But for Grayson Snr, who had a three-year stint at Rovers and led North End to promotion via a Wembley play-off final in 2015, he admits seeing his son’s professional bow gave him the collywobbles. “I’ve managed for 13 years and played in the Premier League, so I know a bit about pressure, but I’ve never been so nervous before a game,” said proud father Simon. “It is a big day for any dad when he sees his son play his first professional game and naturally you want to see him do well. It was a strange feeling sat in the stand, though, because when you’re a manager you can control the destiny of a match to a certain extent, by a tactical switch or with advice. “But looking down at the game watching Joe then it felt a completely different experience indeed. Joe is a product of the Moorland football academy and signed scholarship forms for Blackburn at 15 while still studying at the Clitheroe School.